I'm sure everyone is aware this was delayed about 6 months. There's been a few videos on updates that look really good. This game (thanks Jay'!) was brought to my attention and it was a real winner. Great physics, game play and graphics (which have been toned down from the cartoon like original players). My wish, that somehow MLB would be made aware of this great game and offer up a license contract so they could finally offer a good baseball game to the X-Box catalogue (and get rid of RBI Baseball!). Wow, this looks way better than the original. If we're never getting another Power Pros game over here then Super Mega gets my money every release. Yeah, I'm pretty pumped for SMBB2. Not gonna lie. I'm secretly hoping the delay was a secret deal to get MLB licensing. Regardless, I have a lot of hope that the online aspect of the game is actually going to be a lot of fun. I'm hoping we can get a league going here that was similar to the APF2K8 league we had going. Maybe I'm in the minority, but I really hope they don't license it with MLB. I love the RPG aspect of the game. These things happen to other people. Seconded. Loved the first game almost as much as MLB Power Pros and maybe more in some ways. Looking forward to it. I liked how streamlined it was and it got right to the heart of the game. While a MLB license sounds good (and worked in Power Pros), I really like the emergent stories that come out of the fictitious characters that don't carry any of the real world baggage and preconceptions. I also like the plans to slightly increase the roster by adding two pitchers and another position player. What platform will most of you be looking to get this on? I am thinking XBone personally. Man, this would be so nice to have on the Switch. Will be getting this on XB1 day one. I do get what what you are saying about going with the fictional guys, and that is a fun aspect. Personally, I just like familiarness real stadiums, teams, and players. I’d be completely okay with the RPG stuff allowing it to go in any direction. I don’t need it to be sim and realistic potentials and such. One thing I did see was that while it will have online play, it looks like online league play will not be in, which is a bummer. I was hoping for a good six man online league like we did with APF2K8, where the fun was competing with friends, not worrying about sim quality gameplay. Dang, too bad. That would have been fun, especially with the hot/cold streaks and pitcher fatigue carrying over from game to game. I will be getting it on PC. I played the crap out of SMB. I hit me right in the Baseball Stars nostalgia feels. Blowfish for life! The plus were for multiplayer in this edition. What is not in the plans, so far, is an ability to run an online league, which kind of blows. In versus play it'll be exhibition games and ranked/matchmaking games only. More info to come on that! So not sure what he's actually saying, but there it is. I'm pretty sure that means no leagues. It will be more like a score chasing mode, where wins will get you ranked higher and such. Look at beautiful upgraded stadiums. And guess what other game won't have online leagues this year. I really wish sports game developers would return to the the old custom league model where you could run a league with just 4-12 teams. Now The Show joins the NHL series as AAA sports titles lacking online league play. The Show may be back, as they imply that they are working to make it better, but the trend has been less and less people playing ever since they started forcing online leagues to have all teams, with the CPU running the teams without users. League play doesn't have to be some sort of sim fantasy. All it has to be is a way to schedule a limited amount of games between friends. As a former sim sports gamer, I have to think we have ruined sports video games in many ways. Looking forward to SMBB2 and just having fun, online and off. Excellent!...for PC folks. Console folks not so much, unless their going to post a 'trial'. Beta sign up open , see their Twitter and Facebook account for link. AND a video of their On-Line Multiplayer! Hope those chosen few are having fun with the Beta. The screens they are putting out really look great. As long as the game play (i.e. baseball physics) are the same, this will be a winner. I’m not in yet, but I’m enjoying The Show for now. I got back in to playing the last SMB on the XBone. Such a good game. The only thing is there is no real dynamic for using your bench outside of pinch hitting (no injuries, LF/RT match-ups, etc.). Likewise, I do not believe there is any player movement, i.e., contracts, trades, FA. Not necessarily a bad thing but part of me would like some of that. I forgot how much I love the 90% automated defense, the quick cuts and lack of superfluous cut scene style animations (outside of HRs), the cutsie indicators of player conditions and attitudes, and the feeling that the designers just get baseball. Cutoff throws are so good; you hang a pitch and you are usually punished; runners get to the base they are supposed to based on situation and where the ball is hit. 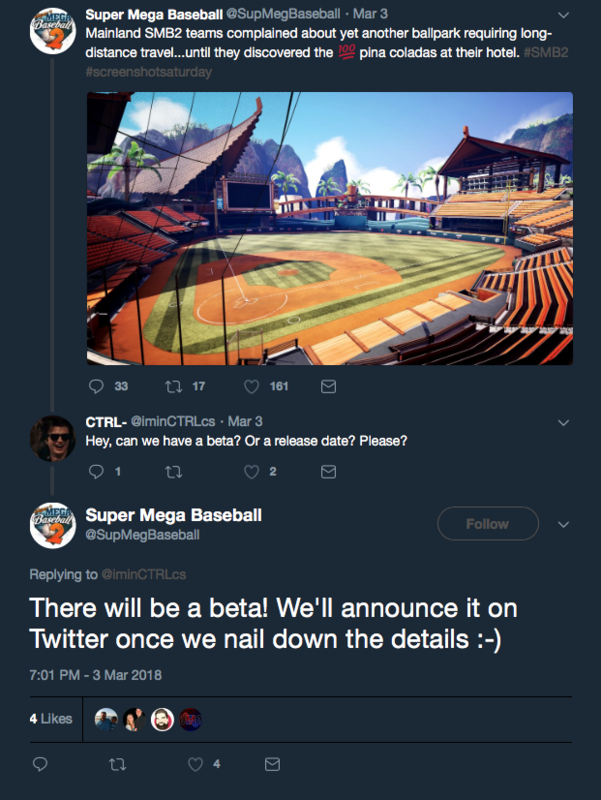 Today we have big news, the full version of Super Mega Baseball 2 will be released on May 1st! Just looks great. Hits most of the minor gripes from the last game and a couple other things that I hadn't thought of that I appreciate. I love the throwing mechanic being more risk reward with the option of the quick tap safe throw. Speed adjustments on running is welcome as well. The Mojo carryover and injury potential means bench players will be more involved, which I like. Quick defense adjustments and subs are welcome and don't have to be used. Limiting pitch types is a plus in my book. I wonder if a coach perk will include "teaching" a pitch type. They are walking a fine line of packing what feels like a rich simulation engine in a breezy, gummy worm wrapper. Really looking forward to this. XB1 Gold members can put their wallets away. Oh wow. That's one timely Games w/ Gold release. I was set to try it on PS4, but it's hard to argue with free. DevStack on X1/PS4/Steam. Add me!